Janet (a.k.a. 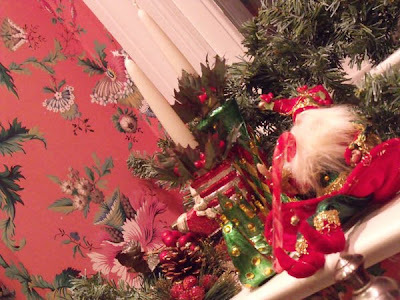 my m-i-l) is a decorating maven...she and my f-i-l Doug have the most beautiful home in Columbia, SC. I can pinpoint the first time I fell in love with wallpaper...it was the moment I walked into the kitchen of this house ten years ago. And I still drool over the pattern every time I'm in that room. The house is beautiful year-round (I'll need to do a house tour for you on the blog) but it is positively enchanting at Christmas. 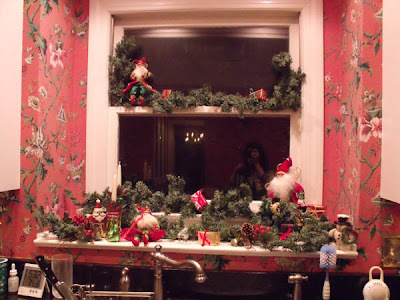 I have come to really love seeing her decorations every year when we are home...and her love for Christmas decorating passed on to me...much of what I do in our own house for Christmas echoes what I've seen Janet do. 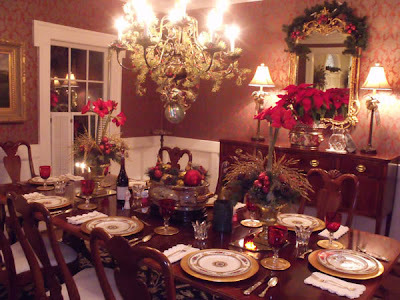 The dining room table set for dinner...don't you love the tall amaryllis? I adore all of the arrangments in this room...and the chandy is just gorgeous. 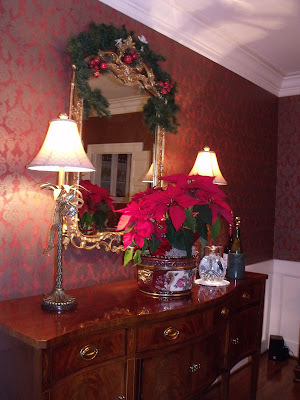 The beautiful buffet...the wallpaper in this room is so elegant and perfect at Christmas. 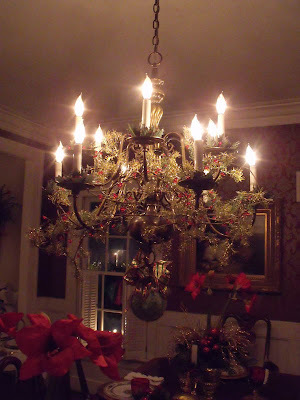 A close-up of the chandy...sorry that it is not better. My favorite part is the large ornament that Janet hangs from the bottom tied with a big ribbon...hard to see it in this picture, but it is very festive. A view of the living room...I love the paneling in this room and Janet has a great collection of nutcrackers that she displays on the mantel...I love looking at them! This is my absolute FAVORITE nook of the house at Christmas (and maybe year round). That mirror gives me heart palpitations...and coupled with the buffet lamps and the purple glass bowl on that gorgeous table...well, there are no words. But THEN she wraps a gorgeous garland around the dish with these beautiful shimmering, ethereal ornaments, and well, it's just too much to take. 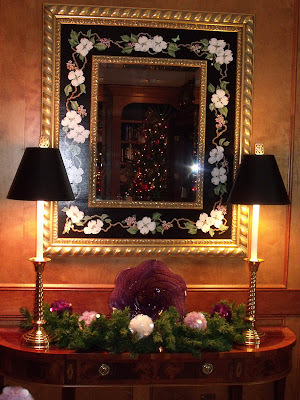 I love this pic with the Christmas tree reflected in the mirror. The kitchen has a jolly little collection of elves and fairies holding court in the window. NOTE THE WALLPAPER...why didn't I get more close-ups of it? I am seriously in love with it. 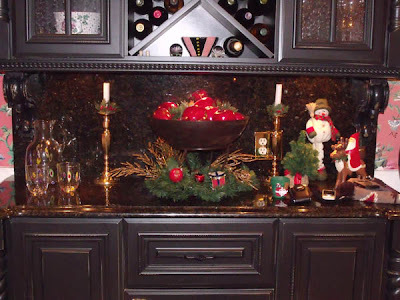 This is a gorgeous built-in piece in the kitchen...and I love the apple centerpiece that Janet displays here. 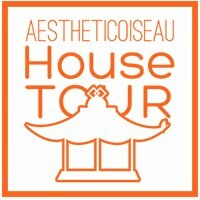 Isn't the house so pretty?? It is the epitome of elegant, traditional design in my book. 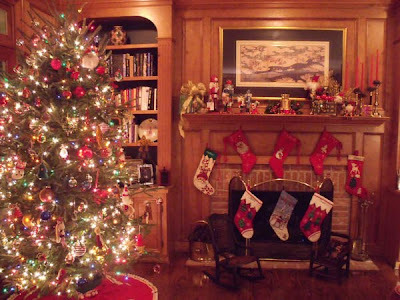 I only took pictures of three rooms, but Janet does a great job of sprinkling Christmas throughout the house...I definitely learned from the best. nice swaggery above the sink!